I always get excited whenever there is a new product release from IT Cosmetics. In case you guys couldn’t tell by now, it’s one of my favorite beauty brands. 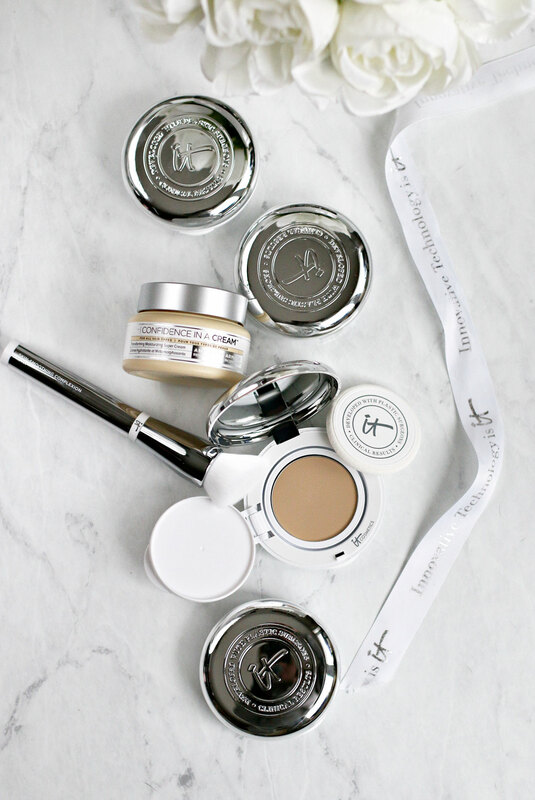 I love their CC+ Cream, Concealers, Superhero Mascara and a bunch of other products. 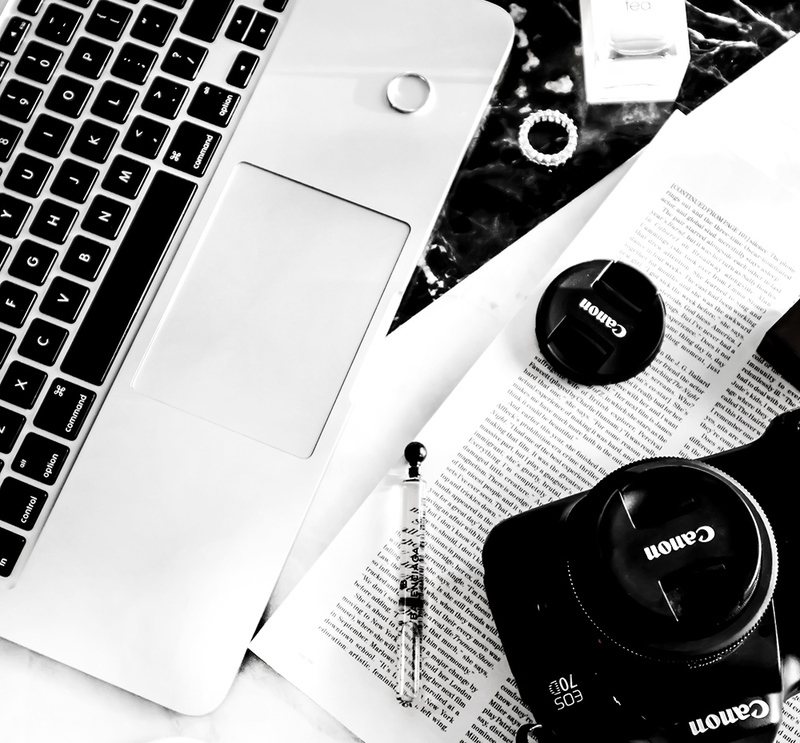 I’m sure that all of you already know this, because I mention their products here on the blog quite often. “Developed with plastic surgeons, Confidence in a Compact starts its life as your first-ever, clinically shown anti-aging solid serum, and is infused with full-coverage pigments and SPF 50+ UVA/UVB broad-spectrum physical sunscreen. It truly delivers all the skincare benefits of your best-selling Confidence in a Cream, plus your full-coverage foundation and SPF 50+ in one simple step! The groundbreaking solid serum technology combined with anti-aging hydrolyzed collagen, hyaluronic acid, squalane, antioxidants and a super ceramide cream transform your skin. Perfect for even the most sensitive skin, Confidence in a Compact helps boost your skin’s natural regenerative cycle. The proprietary Anti-Aging Armour Regenerative Concentrate is activated upon contact to immerse your skin in moisture, restore visible radiance, reduce the look of pores, discoloration, lines and wrinkles, and improve the look of firmness. You’ll see powerful results instantly and more dramatic results over time. Great skin starts with confidence! IT Cosmetics Confidence in a Compact Foundation in Fair, Light, Medium, Medium Tan, Tan, Rich and Deep. -the applicator included in this compact is actually one of the best applicators to use when applying this product, I usually just toss these away but I love this one! 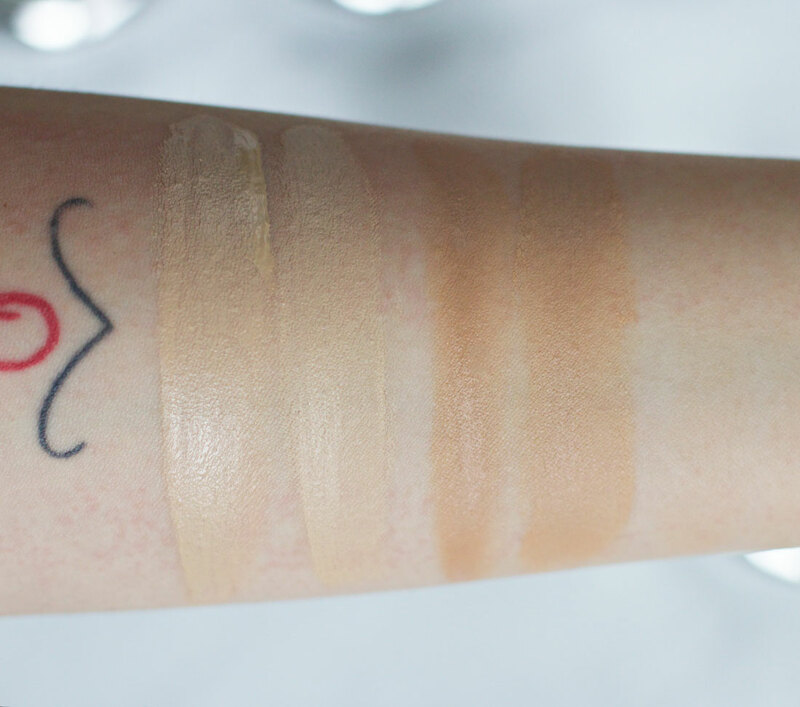 -I noticed that there is a slight difference in the way this foundation applies between a few shades. The product needs to be slightly warmed up to “release” the serum so it feels quite thick at first. As soon as the sponge comes in contact with the product, the product becomes more creamy. I noticed that this was the case with all the shades, except for Deep. Deep was already very smooth (without it needing to be “warmed up”) and it felt almost as if it had more of the serum/cream in it. It felt a bit more hydrating than other shades, too. -the product can be tricky to apply. I definitely wouldn’t recommend using a brush to apply this. To get the best coverage I find that pressing the foundation into the skin works best- either using the applicator that comes in a compact or a beauty blender. -other than hydration, I didn’t really notice any skin-repair benefits, but that is definitely not what I’m looking for in makeup. I only wear makeup for a few hours a day and let my skincare do the job of repairing and improving the tone and texture. 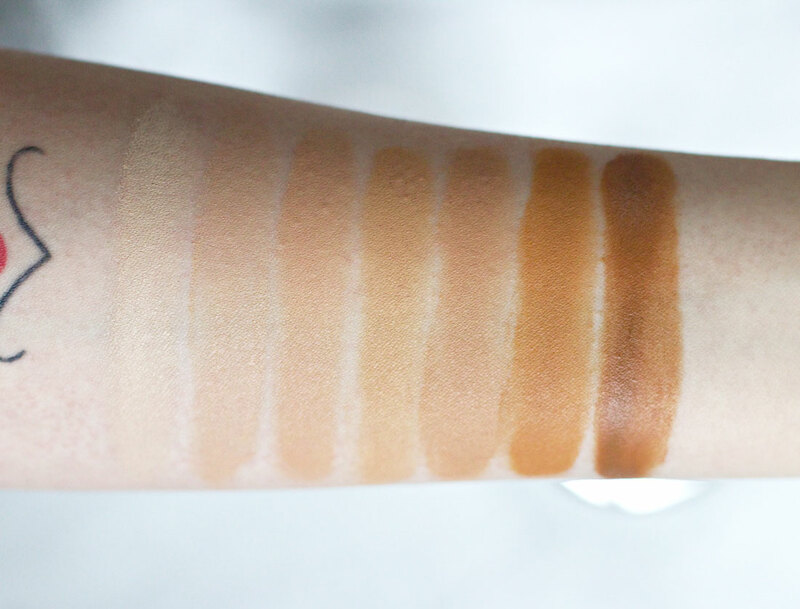 Here you can see how to Confidence in a Compact shades compare to IT Cosmetics CC+ Cream: Left to Right CC+ Cream in Fair, Confidence in a Compact in Fair, CC+ Cream in Light, Confidence in a Compact in Light. 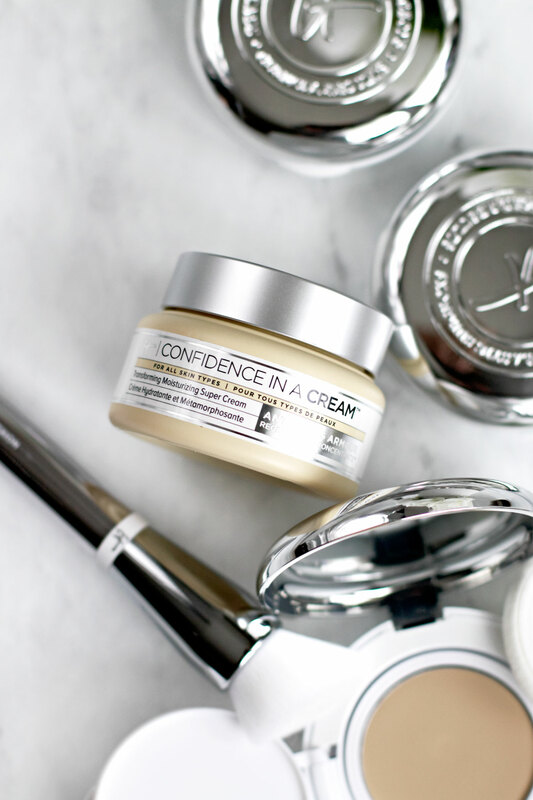 One of the reasons why I was so excited to try the Confidence in a Compact was because it’s said to have all the skincare benefits of their best-selling Confidence in a Cream moisturizer which I am a HUGE fan of. I wouldn’t say that this foundation feels as hydrating as the Confidence in a Cream, but again, I do have extremely dry skin at the moment. With that being said, I’m in love with this foundation. I think that this is one of the first detailed foundation reviews that I’m doing since going on Accutane and usually what I look for in a product like this, is how long it’ll take for it to melt of my extremely oily skin. Well, I can tell you that this will last all-day long on you, if you have a dry skin type. I don’t have to use any primers or powders, at the same time, I don’t have to pay any special attention to what I put underneath this foundation too, since it isn’t drying and does hydrate the skin a bit. I’ve been using this compact for the last couple of weeks and I like to think of it as a slightly lighter version of the IT Cosmetics CC+ Cream (the scent is actually pretty similar too, if not the same). If you’re thinking of trying this foundation and have a normal to dry skin type, I’m sure you’d love it. Keep in mind that the best way to apply it though, is by pressing it into the skin, using a sponge. I wish I knew how this works with oily skin because I definitely want to keep using this once I’m off my meds and go back to being oily.